MicroMist® Airbrush Sunless Tan applies like a professional airbrush spray for an all over worry-free, "just back from the beach tan". 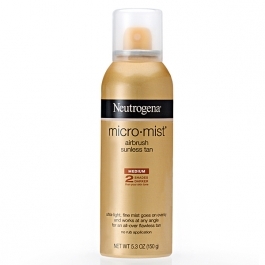 This revolutionary, ultra-fine mist covers evenly, for easy, no-rub application. The one-touch continuous spray works at any angle to tan hard-to-reach places--even your back. It dries fast and won't clog pores. Apply to freshly cleansed, exfoliated skin. Do not spray directly on face. Hold spray 6" away from body and sweep evenly across desired area to tan, keeping the can in constant motion. Stop spraying at the end of each stroke to avoid over application. Apply sparingly around rough skin like elbows, knees and ankles. Sunless tan will begin to develop in 2-4 hours and last for days. Wash hands with soap and water immediately after use. Reapply as needed to maintain or deepen color. Avoid contact with eyes. Do not spray directly on face. This product does not contain a sunscreen and does not protect against sunburn. Repeated exposure of unprotected sun while tanning may increase risk of skin aging, skin cancer and other harmful effect to skin even if you do not burn. Flammable. Contents under pressure. Do not use near fire, heat or while smoking. Do not puncture or incinerate. Store at temperatures below 120° F (48° C). Keep out of reach of children. Use only as directed. Intentional misuse by deliberately concentrating and inhaling the contents can be harmful or fatal.